The census of 2000-01 showed that the dropout rate from schools in Karnataka stood at 10.5%. One of the main reasons cited for the dropouts was that teaching methods used in the schools are archaic, and do not sufficiently motivate students to remain in class. Educationists say that in addition to outdated teaching methods, inadequate teaching learning material (TLM) and laboratory equipment are also factors that contribute to dropouts. Taking heed of these observations the state government decided to revamp the education system in the state-run schools. Educationists and teachers were roped in to devise new teaching methods. An interesting curriculum, along with interactive learning, was the new mantra adopted. "Chaitanya" a special programme to train the teachers in adopting new interactive teaching methods, was designed. Chaitanya was an extension of the "Nali Kali" or 'joyful learning' programme that was tested successfully in some of the schools in Heggadedevana Kote taluk in Mysore. Nali Kali was a collaborative effort of the state government and UNICEF. Both these programmes stress interactive learning methods. The teachers use colourful charts and stories to explain concepts from the textbooks. 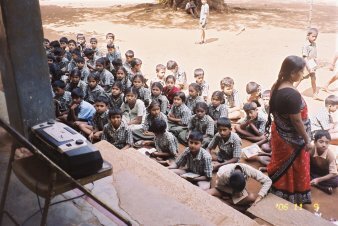 Picture: Students listening to a radio programme in a government school in Hebbagodi, near Bangalore. More than 50,000 teachers have undergone training under the Chaitanya programme in the last four years. Both primary and higher secondary students have benefited as a result. Dr. T Padmini, a retired Head of the Department of Education at Mysore University, who was part of the Chaitanya's design team says "The state's intended curriculum is very well designed, so what we needed was a child friendly way of teaching it. Boring teaching methods can cause cumulative deficiencies of interest in children, which may lead to dropouts. The Chaitanya programme teaches teachers to use stories, songs and even drama to teach concepts." Alongside government action, NGOs too are leading from the front in interactive learning. Pratham, in Mysore, is promoting Universal Elementary Education (UEE) by partnering with the Department of Public Instruction. The organisation works with government schools in the slums of the city. They run "Balawadi" and "Balasakhi" programmes in these areas. The Balawadi programme prepares children for formal education using play-way methods, ensuring the children enjoy their school-going experience. Balasakhi is a remedial education programme, in which the NGO appoints a special teacher at the government school who aids the children in learning languages and mathematics using the special packages developed by Pratham. The government also introduced the trimester system to reduce the burden on the students. Mr. Chandrashekar, principal of government higher secondary school in Mysore says "Pratham's intervention has been very useful for us. The children have fun learning Kannada and arithmetic and because of that it becomes easier for us to teach them what is in the syllabus". The children too like the new way of learning. Salman, a Class 4 student from Mysore, says "addition and subtraction is more fun now. Earlier I was scared of arithmetic problems." The language kit developed by Pratham along with Dr. Padmini is hot favourite among parents too. They say it is especially helpful to students who don't speak Kannada at home but have to learn it in school. The new method however is not without problems. Teachers say it has increased the burden on teachers. Meera Bai, headmistress of Sri Ramakrishna Education Society, Bangalore says "It is true that the new method is good for students but we have to spend a great deal more time on preparing for the lessons and evaluating them. Giving individual attention becomes very difficult when there are more than 40 students in each class." But the educationists say that the teachers are taking their responsibility lightly. Dr Padmini says "Many a time I have found that the teachers lack the initiative to adopt new methods and also lack competency and knowledge, which is essential in this profession." The teachers however counter this. B Geetha, a teacher, says "I have been this profession for more than 30 years and with passing years we have been given more and more clerical work like population census, electoral list reviews and election duties. Plus the new government programmes like Chaitanya and mid-day meals require regular reports. How can we spend more time with the students while we are expected to do paperwork?" While the new teaching methods are struggling to take root, the need for improved education remains evident. The Annual Status of Education Report 2005 showed that in Karnataka only 50% of the students were able to read a simple story from the text book, compared to a much higher 81% in neighbouring Kerala. This was conformed by the second edition of the survey, out recently.